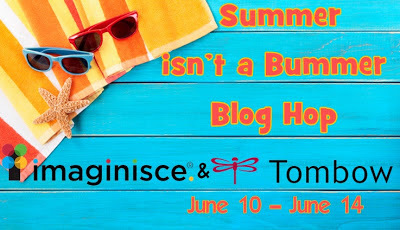 As I mentioned yesterday Imaginisce & Tombow have teamed up this week for a super fun Blog Hop! If you've been doing the Blog Hop today then you've probably made your way here from Suzanna's blog. Thanks for joining me today. I hope you've been enjoying the hop so far. As you have already read on the company blogs - there's some great prizes to be won and all you have to do is leave a comment on the designers blog to be entered to win! How easy is that?! 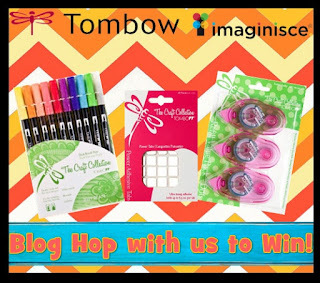 Plus we want to invite you to LIKE the Imaginisce & Tombow Facebook pages as well. Imaginisce is giving away a complete collection of their Endless Summer! It's perfect for this time of year! Tombow is giving away this fabulous prize!! It's wonderful! I was thrilled to work with some Tombow products because I just love their markers. Plus their adhesive is amazing! I used the Dual Brush Pens (Jelly Bean set) with the Snag'em Stamps (soda bottle) from Imaginisce. They are a perfect combo! The colors in this collection are super fun & bright! 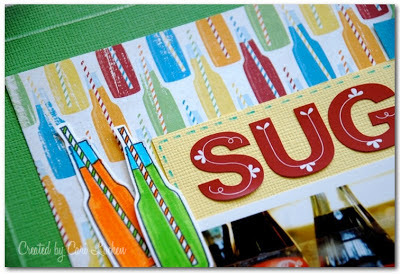 I adhered the little soda bottles using the Power Tabs from Tombow (which an adhesive with a bit of dimension). I also used the marker to make some small dashed 'stitch-like' lines on the cardstock. 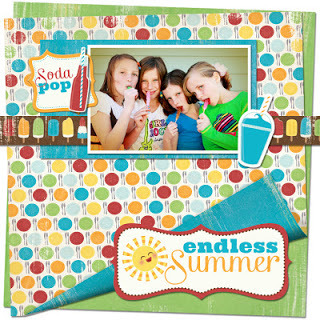 A closeup look at some of the Endless Summer goodies in this collectino from Imaginisce. Thanks for stopping by and hope you'll join in the Blog Hop again tomorrow & Thursday!! Love the colours, Cari. So bright and summery! Such a cute layout, the colors really "pop!" AWE...love this layout! Fabulous use of the markers! what an awesome layout! the images are perfect for your pictures. Oh wow! Such a stunning layout!! Love all the little embellishments you added in!! Cute layout and cute kiddos. Love the soda pop paper. love this layout and it's colors! Love this layout! Thanks for sharing. cute cute layout !!! what a special treat to have soda !! yummy !! love that you scrap everyday photos those are the best !!! Love love love this layout. I am loving this collection. Super fun layout. The colors are great and your details are very neat. Fun Layout Page! I love to color in stuff too! Thanks for sharing! Very cute and fun layout! Neat layout! Love the bright colors. 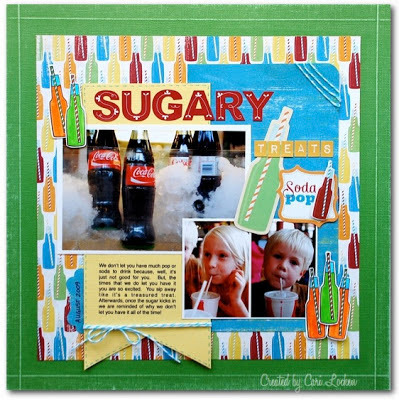 What a cute layout, love the bright colors! Thanks for sharing. Your page is so cheerful! I love the lettering in Sugary, it helps the page pop. are fun to look at. Cari, I had to look twice and closely because ur little ones look like my neice and nephew! Love the Jelly bean pen set with the Imaginisce Endless Summer collection! Evidently, I need to try these Tombow Power Tabs! Thanks for the ideas! Super cute layout! Love that soda paper and embellies. I want! Fun layout, I really like how the markers are a perfect color match to the papers! Those soda bottles and straws are adorable...and what perfect background paper!! Sweet layout...love the image and the papers too. LOVE all those GREAT layers!! FABULOUS LO!! Super fun layout!! I LOVE those papers and bottles!! So cute!! Very cute. Great use of the collection. 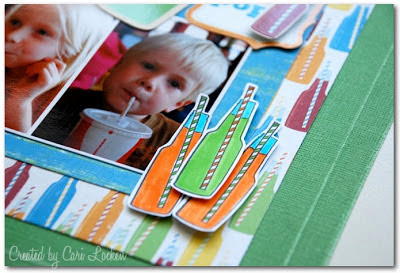 Love the striped string you used to coordinate with the straws! Very clever! What a great page! 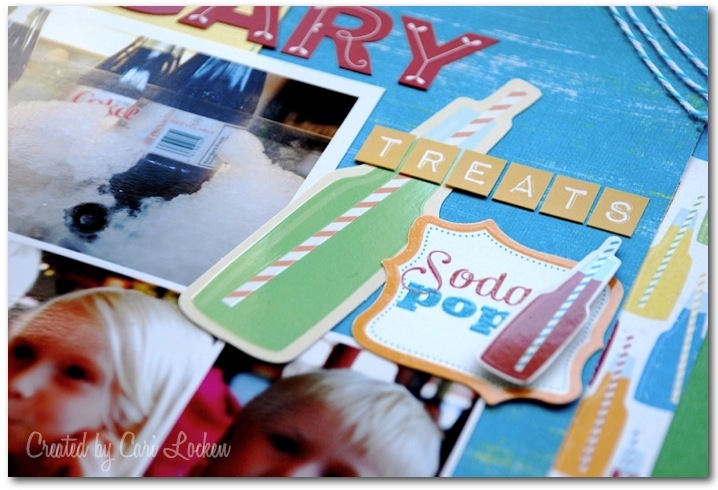 Love the stamps of bottles, they are the perfect finishing touch!